Kids on average spend at least two hours every day staring at a screen. If they are going to spend so much time staring at a tablet or smartphone screen, why not make their screen time educational while keeping the fun alive? That’s the premise of PlayShifu’s new Plugo AR gaming system. 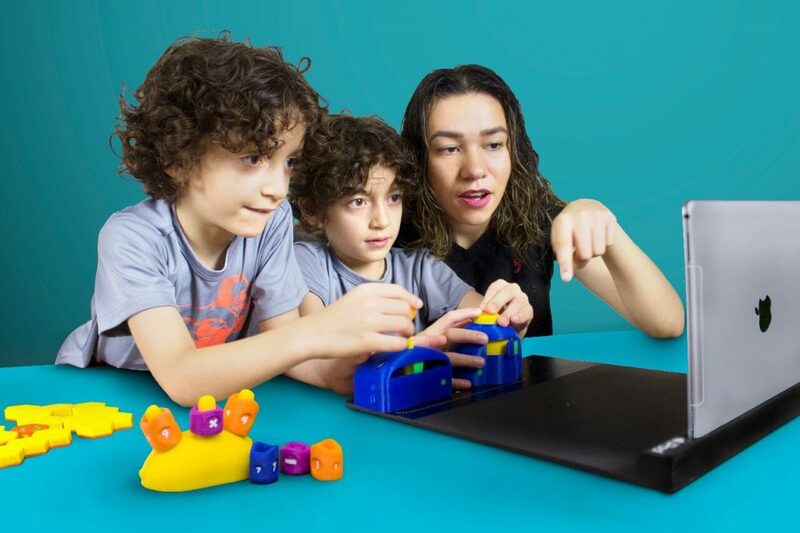 Your kid can attach a smartphone or tablet to the platform and then use one of Plugo’s tactile toys to play games that are more than just games. They are designed to help children learn math, logical reasoning, vocabulary, dexterity, critical thinking, spatial reasoning and more. The whole Plugo AR gaming system consists of a gamepad that holds the smartphone or tablet, and controllers. PlayShifu says the system is compatible with Apple’s iPhones and iPads, and Samsung’s Galaxy S series and Galaxy Note series smartphones as well as Galaxy tablets. The startup has developed four types of controllers or gaming kits: Quest, Count, Link, and Steer. The Quest kit includes a joystick and button to offer puzzle-based games. It helps enhance your child’s comprehension, vocabulary, and logical reasoning. The Count kit focuses on math and problem-solving skills. It includes a count spike, three math symbols, and two sets of 0-9 digits. The Link kit includes 15 magnetic hexagonal blocks to solve puzzles and build structures, teaching your child spatial reasoning, logical reasoning, and creative construction along the way. The Steer kit is a “funky-futuristic steering wheel” that lets your child drive underwater, land, and air vehicles. It enhances a child’s lateral thinking, senses of direction, and comprehension. Each of the four gaming kits offers four different games. PlayShifu promises to keep improving the gaming experience by adding new games via app updates in the future. One thing that I particularly like about this gaming system is that it will track your child’s growth and development via problems and challenges in the games. Parents will be able to see weekly and monthly progress reports along with information on how they can take their kids to higher levels. PlayShifu CEO Vivek Goyal said in a statement that Plugo teaches children “through the magic of education augmented reality.” It is designed for children between ages 5-12. It doesn’t involve any electronics, wires, or Bluetooth connectivity. The tablet or smartphone is attached in the dock while the controllers or gaming kits snap to the gamepad with the help of embedded magnets. The phone or tablet’s front camera monitors the movements of the controllers to guide the gameplay. Most of the games in Plugo are language-agnostic, but some story-based games are suitable only for the English-speaking children. PlayShifu plans to add 2-3 other languages in the future. The gamepad is foldable and easy to carry around, and the gaming kits are made with recycled plastic. Earlier this month, PlayShifu launched a Kickstarter campaign to raise $25,000 to help bring the AR gaming system to the market. They have already raised $34,675 from 373 backers, far exceeding their target with 22 days remaining. You can pre-order Plugo on Kickstarter. For $45, you get the Plugo gamepad and one gaming kit of your choice (early backers can get it for just $35). If you want to buy two gaming kits along with the gamepad, it’s going to cost you $65. The whole set of four kits and the gamepad is available for $99. PlayShifu will be offering worldwide shipping. Plugo is expected to enter production in January next year, with first shipments beginning in March 2019.